Around this time each year mixologists everywhere are coming up with new and creative ways to pay homage to the holiday season. Sure, you’ll find more than your fair share of clever shooter names or come across one the usual suspects e.g. peppermint, gingerbread, eggnog, etc. integrated in a ho-hum drink. But if you really take the time to look, you’ll undoubtedly discover some places that will stand out for both quality and inventiveness. One such place is in New York, nestled in the cozy confines of the Iroquois Hotel, retro cocktail lounge – Lantern’s Keep. Head bartender Theo Leiberman (part cocktail historian/conservationist, part mad scientist) offers us his take on “Holiday in a Bottle” – The Yuletide Duet. 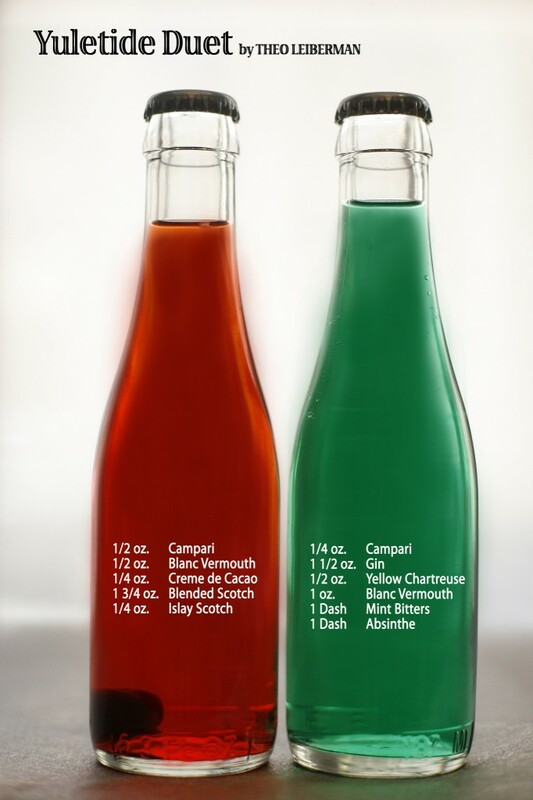 Sold as a pair these bottled cocktails, though tongue-in-cheek in presentation, are solid cocktails made with classic ingredients like Campari. I love the idea of bottling true cocktail (not so much the mudslide, orange dreamsicle, spiked lemonade, or anything electric blue but that’s a discussion for another time) Theo’s carbonated Negroni had caused a positive buzz. This cocktail is available for a limited time only (just this month) so if you are in Midtown, stop by and give it try.